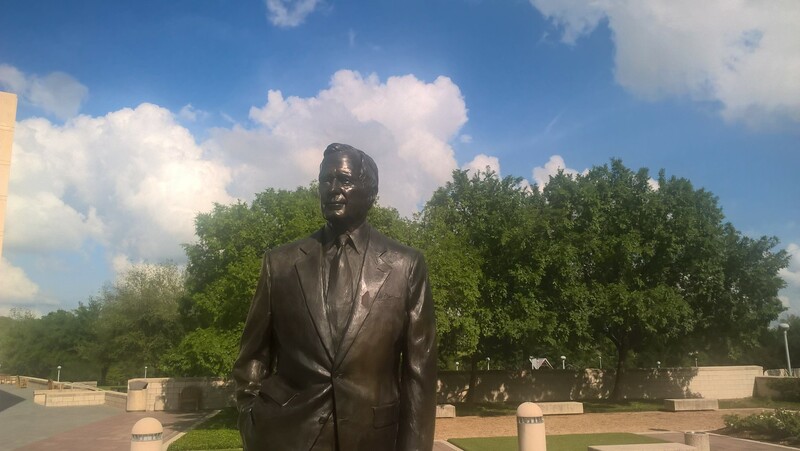 George H. W. Bush statue, College Station, TX. One of the distinctive features of American politics in comparison to the UK is the establishment of Presidential Libraries and Museums. Franklin D. Roosevelt started the trend with the creation of a library at his home at Hyde Park, New York in the early 1940s. Since then, every president has had such an institution, administered by the National Archives and Records Administration, and one was created retrospectively for Herbert Hoover. Texas is particularly well-served, because it has three presidential libraries: those of Lyndon B. Johnson, George H.W. Bush, and George W. Bush. 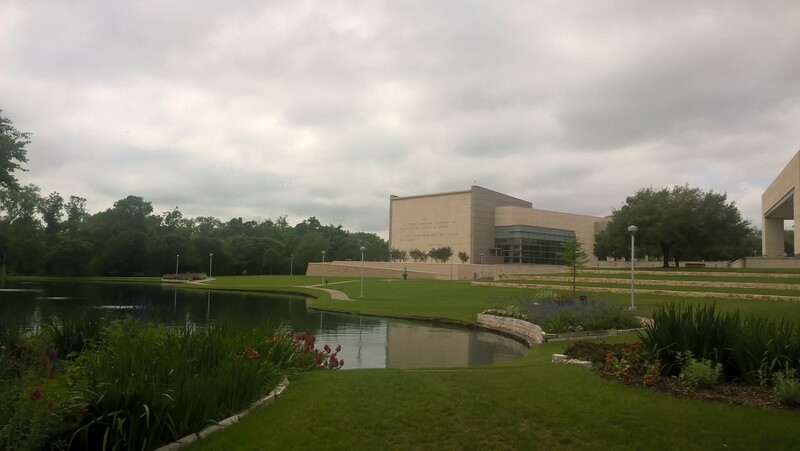 This April we explored Texas’s presidential libraries and museums, looking at available archival material (relating especially to Anglo-American relations, and Space policy) and assessing the interpretation that each offers of the record of the president concerned. We started at Dallas, with George Bush Junior’s library, located at Southern Methodist University, then moved on to LBJ at the University of Austin, Texas, and are currently writing this blog in College Station, home to the library of Bush Senior. Each Library holds the archives of the President concerned. Unsurprisingly, given the recentness of George W. Bush’s presidency, the vast bulk of his records remain classified. What little that has been released (in heavily redacted form) is available online. It is nonetheless possible to draw some limited conclusions from the metadata (who wrote to who, and on what dates, etc.) about the frequency and nature of Anglo-American contacts. LBJ’s archives provide a much richer and more comprehensive picture of transatlantic relations during the 1960s. American politicians tracked the erratic and drunken activities of Labour’s George Brown, and the somewhat self-important behaviour of Harold Wilson (who at one point gave the President a Gannex raincoat that didn’t fit), and observed the rise of Conservative leader Edward Heath. What emerges from the LBJ archive is the comprehensive scale and wide ranging concerns of Anglo-US discussions. Some of these, such as Vietnam policy and Britain’s currency problems are well known. Others such as the 1965 war between India and Pakistan, and the crisis of Rhodesia that started in the same year, are less familiar. George H. W. Bush Library, College Station, TX. The archives indicate that by the time of the George H.W. Bush presidency relations focused more narrowly, in particular around the transition to the post-Cold War world. These papers too contain significant redactions, whereas Space policy by contrast is better served. This was in a particularly interesting phase, as Bush came to office in time to celebrate the twentieth anniversary of the moon landings, and, at the rhetorical level at least, was very ambitious about the future of space exploration. Again, the fall of the USSR was a significant factor shaping the debate. The complexity of the issues in an era of space commercialisation and NASA’s new focus on monitoring climate change is apparent. Alongside each archive, the presidential museums offer an interpretation of history that is primarily aimed at the public rather than scholars. On the face of it, Johnson and Bush are quite similar in the sense that each of these two presidencies was heavily shaped by foreign interventions: Vietnam, and Afghanistan/Iraq respectively. Yet the contrasts are powerful. Arguably the LBJ Library, whilst acknowledging the highly problematic nature of the Vietnam War, cues the visitor towards a favourable interpretation of Johnson by highlighting first his (undeniably strong) domestic record. By contrast, the George W. Bush museum, framed around the events of 9/11, makes no admission of any significant mistakes and elides the Iraq invasion into a broader narrative of the “war on terror”. The culmination of the presentation is the interactive “Decision Room” exhibit where visitors are invited to reenact the president’s crucial choices, in a format heavily skewed towards Bush’s interpretation. These contrasts raise an important point about the nature of these museums. They convey how each president would like to be remembered, but they are also reshaped by subsequent generations of custodians, who may take strikingly different views of the demands of historical objectivity.